These embossed cards have a classic elegance! Personalize with EITHER a full name or monogram. The price shown is for 25 cards with PLAIN envelopes. 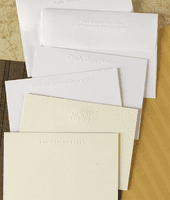 The price INCREASES $18.00 for EMBOSSED envelopes. Folded Size: 6.25" x 4.5"